Can I speak to the Owner please? Do people still speak English in Australia or is it my aging? Of late, I am drawn to the language of silence as the preferred language. There are silent movies why not silent speech? It’s just that I don’t seem to mix with people that still speak normal English. The English speakers have all died, or, like me, are old and prefer silence. Most people, especially the young now, use a kind of rapid language with bits of English thrown in for good measure. On the television or radio, it is the same. There is the Adam-Hills show which has been lauded as the best ever. In between lots of laughter there is that kind of unintelligible rapid machine-gun type talking between hopeful Biebers or other Big Brother like fame seekers. They must be in such a hurry to attain fame and riches. How else to explain their strange fast talk? By the time I try to decipher the first few words the program has changed into a mad dance routine and I am again faced with the manic laughter of a rapturous audience and Adam’s rampant crinkly face all contorted into a somewhat too spontaneous response, making a mockery of anyone still trying to make sense of the first joke. I don’t get it anymore. It all moves too fast. The fun has gone out of comedy. Give me back Charley Chaplin or even Ronnie Barker with Peter Cook and Dudley Moore. They spoke English. At least with those cold- calls on the land line you get to talk to someone from India or the Philippines where English is still being spoken properly. It’s a pleasure to be reassured by a polite; ‘can I speak to the owner, please?’ I always feel honored to answer and take great pleasure in finally meeting like-wise people linguistically still normal and intelligible. It is a great pity that I can’t really extend the conversation. Regrettably, I am not in the market in wanting to get richer, neither need a cheaper phone rate, nor a lucky chance to own a resort on some pacific island with waving palms and coconut clad wearing maidens playing the ukulele. It is a cruel conundrum to find an equal in language but with totally opposite desirable aims or outcomes. I usually am too much of a coward to end the pleading conversation by, just as politely refusing their kind offers. Instead I switch on the electric juicer , hoping the noise will be seen by the callers as something close to a technical hitch. Those cold-callers have families waiting, little mouths to feed and probably live in some shanty without drainage, let alone have electric juicers. It is a cruel world. But, at least they still speak English, heavily accented, but preferable to the gun fire tattle rattle of our locals and TV comperes. 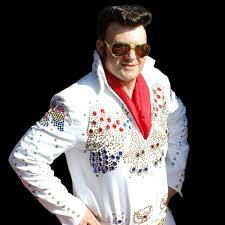 Here in Bowral we have an Elvis impersonator. He arrived on a Saturday morning by small truck laden with large speakers and amplifiers and a DVD player with TV screen on which he can read and hear the words of the songs that he then ‘supposedly’ sings. He is totally into being Elvis Presley with many glittering gold baubles stitched on his vest and flared trousers. His face is old and a brown weathered sixties looking, topped by a shiny wavy pitch-black wig of hair carefully brushed back but enough of it falling over the right side of his fore-head. Through the years he has developed a formidable stomach but still is agile enough to sway, very routinely, backwards and forwards with a speaker in his hand and makes a credible impression as an Elvis. I can tell that the young walk past somewhat bewildered and amused. They wouldn’t know what a legend he represents. The young are all in a hurry to become instantly famous aided by incoherence. I really think that this is what he has been doing for years, perhaps his entire life. The whole electronic caboodle is driven by a small petrol generator that is only just less noisy than the pre-recorded music and singing. He has a printed note in an open suitcase asking to support him and his love for ‘The King’. I suppose his cause is as good as any or better. He certainly deserved a couple of dollars. It can’t be easy to pack and unpack this half-truck load twice daily doing the rounds around Australia. A true troubadour. What dedication for an idol that is still lingering around yet faded into history like forgotten notes left in a bottom drawer. I try and spend time listening to this Elvis still sung in fairly normal English. First of all, my sincere apologies to Atomou. I have a radical suggestion as the answer to your article. Go down to the TAB on a Saturday and place bets on various horses. If you are able-after race seven or eight-to understand what the race-caller is saying you will find Adam Hill’s program instantly understandable. The poor old Elvis stands in the Bowral spring winds, and sings, I feel so sorry for him…I’m sure many others do as well and give him some money, to add to his pension, he looks old…he’s not bludging ,he’s singing for his supper. the bludging bit is for Carisbrooke if he happens to come here. I have been to Adelaide for an audition last week. What for is of on no more consequence at the moment than what I have been doing for the previous thirty years that I live in the electorate of BARKER of all things, Living on a smell of the greasy spoon that is a couple of blocks away and a poorly stocked supermarket selling pretty old food. Tie me Kangaroo down sport. How apt. A reference to making noise with the mouth … although my good friend’s name is Barker and she and I read aloud Thomas Hardy’s The Woodlanders and only thus discovered it is about ‘the barkers’ stripping bark off trees for various industrial purposes. Not lapadoodles or whatever they are called or Pekinese. Strange noises once only came out of my own mouth for a while sometimes like barking. I have taught myself to speak again so I went to an audition primarily to try myself out. I am sure there are those that are enraptured by your speech. My own efforts in public speaking are pretty rare, however, once warmed up I am not too bad. It all depends on the response. No response and you are on the wrong track, even being booed is better than just silence. I am in awe of those that can get on stage and ad lib just like that and…be funny as well. Judy Lucy is funny.